This article was originally written by Johar Ashfaque from the University of Liverpool, and was originally published by The Conversation. When we look out at the Universe – even with the most powerful of telescopes – we can only see a fraction of the matter we know must be there. In fact, for every gram's worth of atoms in the Universe, there are at least five times more invisible material called 'dark matter'. So far scientists have failed to detect it, despite spending decades searching. The reason we know it exists is because of the gravitational pull of galaxy clusters and other phenomena we observe. The matter we can see in a cluster isn't enough to hold it together by gravity alone, meaning some additional invisible or obscure matter must be present. But we have no idea what it is – it could be made up of new, yet undiscovered particles. There are four fundamental forces that a dark matter particle could interact with. There is the strong force that binds together the atomic nucleus; the weak force which governs the decay of particles such as radioactivity; an electromagnetic force that mediates the force between charged particles; and the gravitational force which governs gravitational interaction. To observe matter in space we need it to interact via the electromagnetic force, as this involves the release of light or other electromagnetic radiation that a telescope can register. There are quite a few candidates already – each with its own particular way of interacting. However, some theories are more likely to be successful than others. Here are the five candidates for particles that I think have the best chance. The weakly interacting massive particle, or 'WIMP', is a hypothetical particle that looks promising. It would be completely different from the type of matter we know and would interact via the electromagnetic force, which would explain why they are largely invisible in space. Roughly 100,000 of these would pass through every square centimetre of Earth each second, interacting only via the weak force and gravity with surrounding matter. If WIMPs exist, mathematical modelling shows there must be about five times more of these than normal matter, which coincides with the abundance of dark matter that we observe in the Universe. This means we should be able to detect them through their collisions as this would cause the charged particles on Earth to recoil, producing light that we can observe in experiments such as XENON100. WIMPs have been the subject of a lot of extensive research, especially beyond the Standard Model of physics, which independently predicted that such a particle must exist – a coincidence dubbed the 'WIMP miracle'. Axions are low-mass, slow-moving particles that don't have a charge and only interact weakly with other matter which makes them difficult – but not impossible – to detect. Only axions of a specific mass would be able to explain the invisible nature of dark matter – if they are any lighter or heavier we would be able to see them. And if axions do exist they would be able to decay into a pair of light particle (photons), which means we could detect them by looking for such pairs. Experiments including the Axion Dark Matter Experiment are currently looking for axions in this way. MACHO stands for 'massive astrophysical compact halo object' and was one of the first proposed candidates for dark matter. These objects, including neutron stars, and brown and white dwarfs, are composed of ordinary matter. So how could they be invisible? The reason is that they emit very little to no light. One way to observe them is by monitoring the brightness of distant stars. As light rays bend when they pass close to a massive object, light from a distant source may be focused by a closer object to produce a sudden brightening of the distant object. This effect, known as gravitational lensing, depends on how much matter, both normal and dark, is in a galaxy – we can use it to calculate the amount of matter lurking around. However, we now know it is unlikely that enough of these dark bodies could accumulate to make up the vast amount of dark matter that exists. The Kaluza-Klein theory is built around the existence of an invisible 'fifth dimension' curled up in space, in addition to the three spatial dimensions we know (height, width, depth), and time. This theory, a precursor to string theory, predicts the existence of a particle that could be a dark matter particle, which would have the same mass as 550 to 650 protons (these make up the atomic nucleus together with neutrons). This kind of particle could interact both via electromagnetism and gravity. However, as it is curled up in a dimension we can't see, we wouldn't observe it by just by looking at the sky. Luckily, the particle should be easy to look for in experiments as it should decay into particles we can measure – into neutrinos and photons. 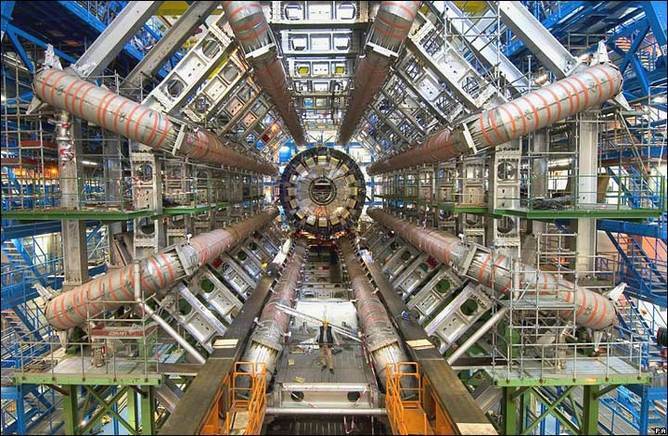 However, powerful particle accelerators like the Large Hadron Collider are yet to detect it. Theories combining general relativity and 'supersymmetry' predict the existence of a particle called the gravitino. Supersymmetry, which is a successful theory explaining a lot of observations in physics, states that all 'boson' particles – such as the photon (light particle) – have a 'superpartner', the photino, with a property called 'spin' (a type of angular momentum) that differs by a half-integer. The gravitino would be the superpartner of the hypothetical 'graviton', thought to mediate the force of gravitation. And in some models of supergravity where the gravitino is very light, it could account for dark matter.